Apparatus for drilling thin paper or glass plates, under the influence of high voltage. To achieve the piercing, the strip is placed between the electrodes in the lower middle of the device and the electrodes are connected to an electrostatic machine. 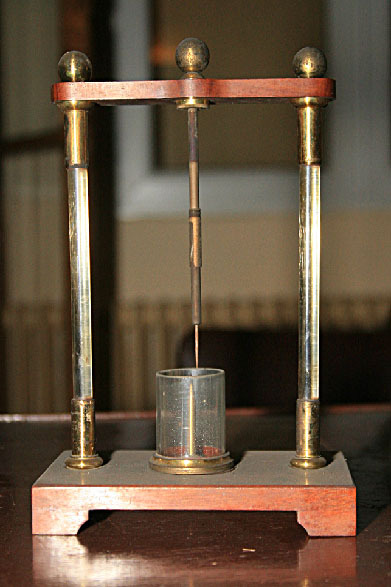 An identical device is exhibited at the Museum of History of Science in Florence, and a similar one, which used to belong to the 1st Gymnasium of Plaka, is exhibited at the Museum of the National Observatory of Athens This device has been attributed, according to the Museo Galileo, to the French Jean-Antoine Nollet, who described one relevant experiment in his book “Essai sur l'électricité des corps” (Paris, 1750).